Members of the black community in Northern Ireland gather during Africa Week 2010 at Crescent Arts, Belfast to celebrate their cultures and create support networks. It may be small - around 6,000 according to recent estimates - but Northern Ireland's black community is finding its collective voice and making that voice heard throughout the country. With high concentrations in places like Belfast, Londonderry / Derry, Dungannon and Omagh, Afro-Irish, which include Africans, people from the Caribbean, African Arabs and those with mix heritage, are finding ways to connect with each other and with the larger society. 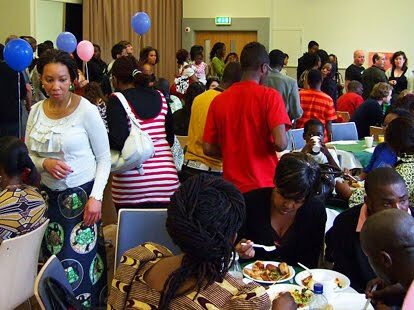 Among those spearheading the effort is the Afro-Community Support Organisation Northern Ireland (ACSONI) which was created in 2003 in response to a growing number of problems facing the multi-ethnic black community. A survey of African and Caribbean Northern Irish found "a lack of resources, community support, credible leadership and role models and a viable infrastructure to address specific needs of individuals, especially young people and women from Africa, Afro-Caribbeans and other individuals of African descent," explained ACSONI Programme Manager Alfred Abolarin.